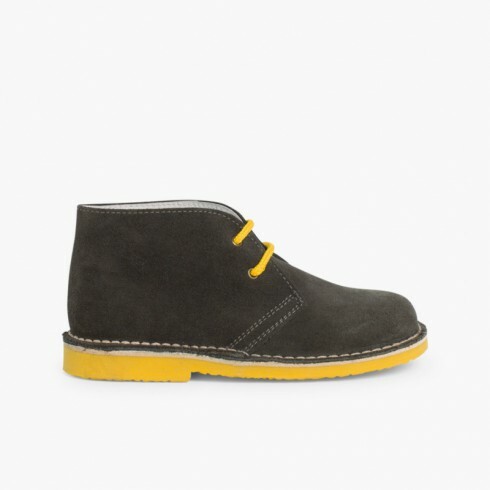 We have them for you too... who said that desert boots are only for kids? These Chukka or Safari boots are really resistant, manufactured in Spain, have suede uppers and we sell them for the lowest price you can find, also we offer a wide range of colours and all of them have leather lining inside. Perfect for everyday wear and combinable with any outfit, whether they wear trousers, leggings or skirts with wool tights. You can fill your wardrobe with our online collection of women's shoes without stepping out of your door. Also at our shoe store we have the shoe models you look for, for the price you can't find, for example, avarcas menorcan sandals , style wellies , bluchers , ballerina flats ... all with the best door-to-door service, free home deliveries and size changes, and with maximum quality. Perfect shoes for school child , colours like on pictures. Very good quality.